The joint initiative focuses on the interests of both institutions regarding identification, administration and funding of Proyectos de Investigación Orientados (Oriented Research Projects). Authorities during the signing of the agreement. Photo: CONICET Photography. In order to establish a regulatory framework, identify, administer and jointly finance Proyectos de Investigación Orientados (PIO), the president of the National Scientific and Technical Research Council (CONICET), Dr. Roberto Salvarezza, and the director of the Facultad Latinoamericana de Ciencias Sociales –FLACSO-[ Latin American Faculty of Social Sciences], Luis Quevedo, signed an agreement at the headquarters of that university. “This agreement will promote research for the whole society”, Dr. Salvarezza commented during the event. Regarding the research, Quevedo forecasted that the topics of the study are going to have great impact due to its growing interest in them. “These subject matters are currently having international dissemination”, he stated. The main topics for the Oriented Projects are: the educational and professional careers of women who attend engineering courses of study; gender differences in the path of uses and assimilation of the TIC in boys and girls; and the gender representations in scientific and technological policy makers. The call will finance the sum of ARS$ 550,000, as a total maximum amount per project for two years of implementation in the case of three CONICET researchers, and in the case of two CONICET researchers, the maximum amount is ARS$385.000. The funding of these Oriented Projects will be at research groups consisting of researchers, fellows and support and technical staff. Each project will require the participation of at least three CONICET researchers and one FLACSO professional, so as to have double dependency. 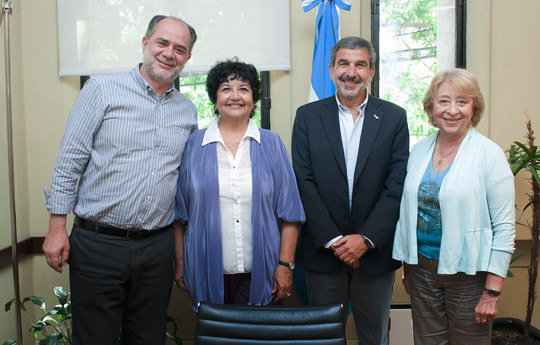 The event was attended by Dora Barrancos, director of the area of Social Sciences and Humanities of CONICET; Patricia Maccagno, director of Agreements and Projects of the management of Scientific and Technological Development of the CONICET; and Gloria Bonder, director of the Gender Area of FLACSO.